This has been a year of major change at JoieFarm Winery. 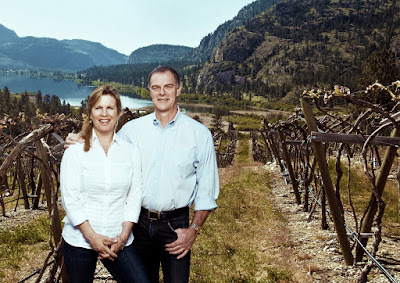 Founding partners Michael Dinn and Heidi Noble went their separate ways, with Heidi taking over full ownership of the winery. Michael is now a partner in a Vancouver wine agency. The most obvious consequence of the ownership change has been the opening of a tasting room and a picnic area. The picnic area is somewhat more elaborate than that term suggests. “Our guests are able to join us on the lawn surrounded by our vineyard to enjoy a casual bite of wood-fired Neapolitan-style pizza, house-made charcuterie boards, and oysters with a glass or civilized bottle of wine,” Heidi writes. A gold medal student at the University of Western Ontario, she earned degrees in both philosophy and literature but turned down an academic scholarship to enrol in the renowned Stratford chef’s school. By the time she was 25, she was running the kitchen for a Vancouver caterer until, after a decade in food service, she switched careers. She completed a sommelier diploma and began working for a wine agency. When she and Michael opened JoieFarm in 2005, she operated a cooking school for several years, in part because the winery needed the cash flow while getting established. Over the years, several wineries, like JoieFarm, have succeeded without public tasting rooms. But when a winery reaches the size of JoieFarm, it makes good sense to open an onsite wine shop. That is where the most profitable sales are made. As well, the interaction between the winery owner and the customers reinforces consumer loyalty. Here are notes on the current JoieFarm releases. JoieFarm A Noble Blend 2014 ($23.90 for 5,328 cases). This is a blend of six grapes: 38% Gewurztraminer, 30% Riesling, 16% Pinot Auxerrois, 9% Muscat, 8% Pinot Blanc and 1% Schönburger. This aromatic wine shows aromas of spice melon and mango, with flavours of cantaloupe and lychee and a hint of lime on the finish. A touch of residual sugar lifts the aromatics but the final balance is dry. 91. JoieFarm Riesling 2013 ($22.90 for 1,100 cases). This wine begins its appeal with a light gold hue and herbal aromas with an emerging hint of petrol. Yes, this is a correct development of Riesling wines as they age. On the palate, there are flavours of grapefruit, lime and apple. The wine’s 17 grams of residual sugar create a generous texture. The sugar, however, is balanced superbly with 9.2 grams of acidity. The wine, which has a good spine of minerals, is refreshing and the finish lasts and lasts. 92. JoieFarm Muscat 2014 ($22.90 for 396 cases). This wine is made with Moscato Giallo grapes from the two-acre block in JoieFarm’s own vineyard. The wine begins with an intensely spicy aroma of nutmeg and cloves. The spice carries through the palate, along with flavours of guava and lime. The wine’s moderate alcohol (11.4%) gives it an appealing delicacy. It is balanced to have a dry and persistent finish. With its ability to refresh the palate, this is a superb aperitif wine. 92. JoieFarm Pinot Blanc 2014 ($22.90 for 330 cases). This wine, made with grapes from a 27-year-old vineyard, makes a great statement for taking seriously a varietal sometimes overlooked by consumers. This wine, with its aromas and flavours of apple and melon, is generous on the palate. The vibrant acidity gives it a crisp, dry and food-friendly finish. 91. JoieFarm Plein de Vie Brut 2014 ($N/A). The winery has published neither the specifications not the price of this wine. Reading between the lines in the other winery literature, I think this is a blend of Pinot Meunier and Chardonnay. The wine is only available at the newly opened wine shop. It is an uncomplicated and refreshing sparkling wine with aromas and flavours of cherries. The finish is dry. 88. JoieFarm Unoaked Chardonnay 2014 ($22.90 for 443 cases). The winery also maintains that its unoaked Chardonnay is inspired by Chablis – even in a year like 2014 when the vintage produced a ripe, muscular wine. It begins with aromas of apricot, peach and ripe pineapple, with a hint of honey. On the palate, the wine is a juicy fruit bomb with a touch of warmth from the 14.2% alcohol. Not a Chablis but a wine to stand up to a charcuterie platter. 89. JoieFarm Rosé 2014 ($20.90 for 3,145 cases). This is 70% Pinot Noir and 30% Gamay. The destemmed grapes were allowed to soak in their juice for three or four days, extracting a comparatively intense colour for a rosé, along with a bit of tannin for the wine’s backbone. The wine begins with aromas of strawberry, cranberry and cherry. There is a rich medley of berry flavours and a firm, dry finish. 90. JoieFarm “En Famille” Reserve Chardonnay 2012 ($29.90 for 275 cases). The wine begins with a light golden hue and aromas of honey, quince and a hint of toasty oak. On the palate, there are mouth-filling flavours of butterscotch, marmalade, vanilla and ripe pineapple. This is a ripe and rich Chardonnay. 90. JoieFarm “En Famille” Reserve Gewürztraminer 2012 ($27.90 for 208 cases). This memorable Gewürztraminer will transport you to Alsace and the Grand Cru wines from the leading producers there. This rich and powerful wine begins with aromas of spice and lychee. The generous tropical fruit flavours give the wine great length while the 14% alcohol enhances the unctuous texture. This is a tour de force. 93. JoieFarm “En Famille” Reserve Pinot Noir 2012 ($39.90 for 215 cases). The winery’s notes on this wine describe it as the “most masculine style that we have made to date.” It is certainly a bold wine, with aromas of cherries, spice and chocolate that are echoed on the palate, along with savoury “forest floor” notes. Eight months in oak and 18 months of bottle aging have helped the wine develop a velvet texture. 92. This summer, Red Rooster Winery has released two new wines under the winery’s new Henhouse label. Presumably, this might be called a second label unless you think there is something negative about a second label. In my view, second label wines are not inferior wines. Karen Gillis, Red Rooster’s winemaker, is among the most talented of Okanagan winemakers. Second label wines are often the creation of the marketing department, either to freshen the winery’s image or to move a little extra wine. Red Rooster would appear to have both motives in play. The winery’s traditional label bears an elegant outline of a rooster against a crisp white background. The Henhouse label, on the other hand, has an image of a fox. It strikes just the right note of whimsy to attract a consumer’s eye in a wine shop. The moderate pricing of these well-made wines has additional appeal – although the entire Red Rooster wine portfolio is affordable. Red Rooster’s Henhouse Sly White 2013 ($13.99). This is a blend of 44% Pinot Blanc, 19% Chardonnay, 17% Pinot Gris, 9% Gewürztraminer, 6% Riesling and 5% Pinot Auxerrois. This is a fruity, off-off-dry wine with aromas of peach and spice. On the palate, there are flavours of apple and melon. The texture is soft and juicy. This is affordable and easy to drink. 88. Red Rooster Pinot Gris 2014 ($15.69 plus tax). The wine begins with aromas of melon, apple, pear and citrus, echoed in the flavours. The five grams of residual sugar add texture but the balancing acidity gives the wine a crisp and refreshing finish. 90. Red Rooster Gewürztraminer 2014 ($16.99). The wine begins with aromas of rose petal, lychee and spice. On the palate, the wine has spicy grapefruit and melon flavours. The wine is crisp and refreshing. 90. Red Rooster Rosé Reserve 2013 ($21.99 for 480 cases). Lovely bright salmon pink, this wine begins with aromas of strawberry and crème brulé. The palate offers a rich mouthful of cherries and other red berries. The wine is full-bodied for a rosé, with a dry finish. This is a saignée method rosé, incorporating 35% Malbec, 27% Cabernet Franc, 15% Syrah, 8% Mourvedre, 7% Petit Verdot, and 3% each of Pinot Noir and Grenache. This wine demands food. 88. It has become a tradition that members of British Columbia’s consular corps accompany Lieutenant Governor Judith Guichon to the wineries that receive awards of excellence each year. From all accounts, the consuls, who travel by bus, approach wine country with gusto. A few years ago, the consular wine purchases overloaded the bus baggage compartment. A truck was rented to transport the remaining purchases. It is a welcome payday for winning wineries. This was probably not anticipated a decade ago when Government House began delivering the awards at the wineries. During the first two years of the competition, the award winners had to travel to Victoria to accept their trophies. The awards parade has been happening this week, with the Lieutenant Governor and the consuls showing up at 14 winning wineries. The award has enjoyed a much higher profile since the ceremony was taken to the wineries. It also has had far more impact on the wineries. Noble Ridge Vineyards at Okanagan Falls will have known what to expect because the winery is a second time winner. This year the winery won with its sparkling wine, The One 2010, and received the award on July 20. Noble Ridge was one of three Okanagan falls wineries to win this year. The others were B.C. Wine Studio (a first time winner) and Wild Goose Vineyards (a multiple award winner). Earlier in July, I dropped in at Noble Ridge to find out what the consuls might be sampling with owners Jim and Leslie D’Andrea. I was impressed, as my notes will show. I was also struck by an anomaly: Noble Ridge’s excellent Pinot Noir was not among the wines chosen for next month’s B.C. Pinot Noir Celebration. As I understand it, a panel of sommeliers chose the participating wines and turned down the Noble Ridge wine because it was judged atypical. I won’t grizzle too much. I have also made mistakes as a wine judge (one of them involving a different Noble Ridge wine). In defence of the Noble Ridge Pinot Noir, the style is indeed singular. Unlike many pretty “strawberries and cherries” Pinot Noirs, this wine invariable is rich and bold, with dark fruit on the nose and on the palate. I once reviewed the Noble Ridge Pinot Noir 2009, which had 15% alcohol, with the remark that this wine wanted to be a Zinfandel. Typical? No. Good? You bet it was. Noble Ridge makes big Pinot Noirs intentionally. In the last three vintages, the Pinot Noir blocks have been picked at four different times to enhance the flavour profile. It is unfortunate that attendees at the Pinot Noir Celebration won’t get to taste a Pinot Noir that pushes the boundaries the way Noble Ridge does. Here are notes on current Noble Ridge wines. Prices include taxes. Noble Ridge Mingle 2013 ($19.90). This is a blend of Gewürztraminer, Chardonnay and Pinot Gris. It begins with aromas of citrus and spice, leading to flavours of apple, mango and citrus. There is a hint of sweetness on the finish. 90. Noble Ridge Reserve Chardonnay 2012 ($29.90). This wine was best of class at a recent Los Angeles International Wine Competition. The wine is boldly oaked with rich flavours of butterscotch and marmalade. 91. Noble Ridge Pinot Grigio 2013 ($19.90). This is a wine with a juicy texture and nice weight on the palate. There are flavours of apples and peaches with a spine of minerals. 90. Noble Ridge Pinot Noir Reserve 2012 ($29.90). This is a typically ripe, succulent wine, enriched with flavours of plum, black cherry and blackberry. The wine spent between 14 and 16 months in French oak, further broadening the texture. The alcohol is 14.2% but there is no heat on the finish. 91. Noble Ridge Reserve Meritage 2012 ($29.90). This is a blend of Merlot and Cabernet Sauvignon enhanced with a touch of Malbec and Cabernet Franc. The aromas of black currant and black cherry continue to the palate where the fruit is rich, concentrated and sweet. Generous in body and satisfying on the finish, this is a delicious wine. 93. Noble Ridge Meritage 2012 ($19.90). Here is the good value little brother. It is softer than the reserve but still delivers generous flavours of black currant and black cherry. 90. Noble Ridge Reserve Cabernet Sauvignon 2012 ($44.90 for 200 cases). This excellent wine begins with aromas of cassis mingled with toasted oak. The texture is rich, deep and concentrated with flavours of cassis, vanilla, black cherry and blueberry. I recommend cellaring this wine another three years at least. It is drinking well now but is nowhere near its peak. 95. In the past month, CedarCreek Estate Winery has made two momentous announcements and has released perhaps the most original wine ever made here, a Cabernet Sauvignon fermented and aged in a clay amphora. Alexis Moore, a Nova Scotia native who has been making wine in New Zealand, has been hired to take over from Darryl Brooker, recently named the chief winemaker at Mission Hill Family Estate Winery. Alexis is a great catch. A winemaking graduate of Lincoln University in New Zealand, she has now worked 16 harvests in vineyards around the world. She started in Provence. She has worked in the United States at Flowers Winery in Sonoma, and at Penner-Ash Wine Cellars in Oregon. "What an incredible winemaker!" says owner Lynn Penner-Ash, as quoted in CedarCreek’s news release. In New Zealand, Alexis spent five years as assistant winemaker at Seresin Estate before becoming winemaker at Gladstone Vineyard. “I never thought I’d leave New Zealand,” Alexis is quoted in the news release. “After ten years of successfully establishing roots in the wine world, New Zealand had definitely become my home. My great love is Pinot Noir and aromatic whites.” That lines up well with the major focus of CedarCreek production now that the winery is part of the quartet owned by Mission Hill proprietor Anthony von Mandl. It will be interesting to see whether her open mind will embrace such venerable Roman technology as making wine in a clay amphora. Darryl chose to ferment Cabernet Sauvignon from the winery’s Desert Ridge Vineyard north of Osoyoos. Some 500 kg of berries, which were harvested October 28, 2013, went into the amphora without the addition of either sulphur or acid. Deciding against putting the wine in oak, he aged it a further eight weeks in stainless steel and then bottled it, unfiltered and with no additives. The wine, a mere 30 cases, is available at the winery. If you miss the 2013, Darryl repeated this in 2014, using a blend of three Bordeaux varietals to give the wine more complexity. Time will tell what Alexis puts in the amphora. CedarCreek Amphora Wine Project Desert Ridge Cabernet Sauvignon 2013 ($52.99 plus tax for 30 cases). Dark in colour, the wine begins with aromas of plum and cherry. On the palate, there is an astounding purity of fruit flavours (cherry, plum, mulberry). The texture is rich and juicy. The wine is so fruity that it needs to be lightly chilled to be at its best, which is very good. Imagine drinking berry pie. 92. It says volumes about how robust the rosé market is when a winery releases a reserve rosé. Oldfield Series is the tag that Tinhorn Creek gives to its reserves. The current releases include two reserves – and two quite solid non-reserves. The wines are also meant to draw attention to everything else going on at the winery this season. With an amphitheatre and the Miradoro Restaurant, Tinhorn Creek has emerged as one of the south Okanagan’s top destination wineries. Details are on the website, www.tinhorn.com. Tinhorn Creek Pinot Gris 2014 ($16.99 for 8,478 cases). This is a textbook Pinot Gris, with citrus aromas and flavours of apple and pear with a lemony lift. The wine is crisp and quite refreshing. 90. Tinhorn Creek Oldfield Series Rosé 2014 ($19.99 for 829 cases). This is a Cabernet Franc rosé, fermented in stainless steel with both wild yeast and cultured yeast. The colour is a light bronze pink, which the winery calls watermelon. It has aromas of blood orange. After the lightness of colour, the substantial weight on the palate is a welcome discovery. There are flavours strawberry and yellow raspberry, with a dry, lingering finish. 90. Tinhorn Creek Pinot Noir 2012 ($19.49 for 2,262 cases). The wine begins with an appealing ruby hue, On the nose and on the palate, there is strawberry and cherry. The hint of oak adds some spice. The texture is silky and juicy. 90. Tinhorn Creek Oldfield Series Pinot Noir 2011 ($30.49 for 835 cases). It tells you about the vintages when you note this wine has 12.6% alcohol and its “little brother” from 2012 has 13.8%. Tinhorn Creek’s winemakers stood on their heads to make a reserve wine in a tough year. This wine has had 18 months in oak and two in bottle before release – and it is still firm. Time in a decanter delivers a more silky texture. It has aromas and flavours of raspberries and cherries. 89. The current wines being released by Poplar Grove Winery include, unusually, two vintages of The Legacy, the winery’s iconic red wine. There appear to be two reasons for this. To begin with, the volumes of both vintages (2010, 2011) are small. The 2010 vintage was cool, forcing Poplar Grove (and other wineries) to reduce crop load dramatically in order to ripen the grapes. The Legacy is always blended from the best barrels but there were a lot fewer barrels to choose from in 2010. Production of The Legacy was limited to 350 cases, a volume that Poplar Grove’s wine club will buy in a heart beat if allowed to do so. By releasing the 2011 vintage (550 cases) at about the same time, Poplar Grove has a fighting chance of satisfying both the wine club and restaurant clients. “2011 was also tough vintage but the 2011 Legacy is very good,” Stefan says. “It’s pretty dense.” He would have preferred to make 700 cases but decided during blending that anything more than 550 cases risked diluting the quality. The 2012 The Legacy, which is may be in bottle already, is from a very strong vintage. The winery will release 900 cases next year. Stefan thinks he could have produced twice as much easily but that risked saturating the market for a wine in this price bracket. That brings me to the second reason for releasing two vintages at the same time. Traditionally, Poplar Grove held The Legacy back until it was five years old. Stefan is trying to move that to four years. “Five years is unsustainable,” he suggests. “It is too hard to plan five years ahead. Judging by my recent tastings, the wines are good even earlier. Monster Vineyards is Poplar Grove’s value label. Here are notes. Poplar Grove Pinot Gris 2014 ($19.90). This refreshing wine begins with aromas of citrus and apples. On the palate, there are layers of fruit flavours – apple, pear, nectarine, with a lively spicy finish that does not want to quit. 91. Poplar Grove Chardonnay 2014 ($21.90). This is a fresh, fruit-forward Chardonnay that was fermented 80% in stainless steel. The 20% that was barrel-fermented adds a complexing hint of hazelnut to the palate. The wine begins with aromas of citrus and apples. On the palate, there are flavours of grapefruit, passion fruit and pear. 90. Poplar Grove Blanc de Noirs 2014 ($24.90). Salmon pink in hue, the wine begins with aromas of strawberries. On the palate, there are flavours of strawberries, sour cherries, watermelon and rhubarb. This is a saignée rosé; the three red varieties has three hours of skin contact. The blend is 41% Malbec, 24% Merlot, 19% Syrah and 16% Viognier. The mid-palate is juicy but the finish is crisp and dry. 90. Poplar Grove Cabernet Franc 2012 ($34.90). This has always been one of this winery’s signature red wines. It begins with brambleberry aromas and rustic tannins. Time in a decanter brings out a rich texture and generous flavours of black cherry, blackberry, plum and vanilla. The finish is long and satisfying. 92. Poplar Grove Merlot 2011 ($29.90). This wine was aged 21 months in French oak and another 18 months in bottle before release. That is characteristic of the herculean effort the winemakers made to burnish a wine from one of the Okanagan’s most difficult vintages since 1999. For the most part, it is a great success. The wine’s texture is svelte and polished. The aromas of black currant, blackberry and tobacco continue to bright lingonberry and currant flavours. There is a slight note of spice and earth on the finish. 89. Poplar Grove The Legacy 2011 ($49.90 for 550 cases). The blend is Merlot 43%, Cabernet Franc 41%, Malbec 13%, Cabernet Sauvignon 3%. This firmly textured wine begins with aromas of black currant and black cherry, which are echoed on the palate, along with flavours of coffee and dark chocolate. There are spicy fruit flavours on the lingering finish. This wine will age for at least 10 years. 94. Poplar Grove The Legacy 2010 ($49.90 for 350 cases). The blend is Merlot 33%, Malbec 24%, Cabernet Sauvignon 23%, Cabernet Franc 20%. The wine begins with lovely cassis aromas which echo the cassis flavours on the palate. Lighter in body than previous vintages, this is nevertheless a wine of great elegance. It also has will age to its 10th birthday. 93. Monster Vineyards White Knuckle 2014 ($17.90). This is a blend of 31% Pinot Gris, 25% Viognier, 17% Verdejo, 15% Riesling and 5% Chardonnay. Each varietal was fermented separately at a cool 16°C. It all adds up to a crisp and fruity blend with aromas and flavours of pears, apricots, melon and apple. 89. Monster Vineyards Skinny Dip Chardonnay 2014 ($17.90). This is an unoaked Chardonnay. The touch of residual sugar gives the wine a juicy texture and accentuates the aromas of peach and melon and the flavours of apple and citrus. 89. Monster Vineyards Riesling 2014 ($17.90). This refreshing and fruit Riesling balances its bright acidity with a hint of residual sweetness. The moderate 12.3% alcohol adds to the wine’s ability to dance lightly across the palate. It has aromas and flavours of lime, lemon and green apples. 88. Monster Vineyards Rose 2014 ($15.90). This is 64% Malbec, 17% Viognier, 15% Merlot and 4% Syrah. The juice of the red varietals was obtained by bleeding the tanks after minimal skin contact. The wine was cool fermented and was finished with seven grams of sugar per litre (and 7.5 grams of acidity). This balance gives the wine a juicy texture and a crisp finish. Bright pink in colour, the wine begins with aromas of strawberries and melon. It delivers flavours of cherries and cranberries. 89. Her name is Amber Pratt. Judging from the quality of the recent releases, she has put quite a positive imprint on this winery. Born in Kamloops and raised in Victoria, she took an indirect path to winemaking, first training in horticulture at the Horticulture Centre of the Pacific. Just as she was getting her career launched, a pathogen forced the nursery she was working with to destroy its stock. She moved to the Okanagan early in 2009 to enrol in Okanagan College’s winemaking and viticulture courses. She finished in June, a bit early to find a job in a wine cellar, so she went to work in the tasting room at Nk’Mip Cellars for the season. That allowed her to research the industry and its wines. By fall, she was sending her résumé to select wineries. Michael Bartier, then the winemaker at Road 13 vineyards, offered Amber a job. In her second year there, Amber went France to visit wineries in the Loire that were making some of the varieties she was working with at Road 13, including Chenin Blanc. While there, she got an email offering her a cellar hand position at Black Hills Estate Winery. After a year in that position, she was promoted to assistant winemaker. The move to C.C. Jentsch in 2013 promoted her to winemaker, with the opportunity to put her stamp on an emerging brand. Both the 2013 and 2014 vintages produced good grapes, and lots of them. That has given Amber the opportunity to identify select lots for special treatment. The result has been the winery’s small lot series, wines that should turn heads. Here are notes on the recent releases, along with the more affordable large volume releases. C.C. Jentsch Cellars Small Lot Series Chardonnay 2014 ($35.90 for 82 cases). Barrel-fermented and aged in new French oak for six months, this wine mingles the oak and nutmeg with citrus flavours and aromas. The bright acidity give this wine age-ability. The winery suggests cellaring this at least for a year. Good advice; time will give a seamless integration to the wine. 91. C.C. Jentsch Cellars Small Lot Series Viognier 2014 ($35.90 for 129 cases). The wine begins with lush aromas of nectarine, apricot and pineapple. Everything is echoed on the palate, including the sensually lush texture. The rich finish is persistent. 91. C.C. Jentsch Cellars Small Lot Series Malbec 2013 ($49.90 for 45 cases). Dramatic aromas of blueberries and violets just jump from the glass, leading to flavours of blueberries, blackberries and cherries, with a hint of vanilla. There is a very long spicy and peppery finish. The 17 months oak aging has given this wine finely sculptured tannins. 93. C.C. Jentsch Cellars The Quest 2014 ($17.90 for 363 cases). This is a blend of Chardonnay 61%, Viognier 27%, and Gewürztraminer 12%. With 13.8% alcohol, this is a robust wine, bursting with fruit aromas and flavours. On the nose, there is apricot and tangerine. On the palate, there are rich flavours of apricot, baked apple, ripe pineapple and tangerine. 89. C.C. Jentsch Cellars The Dance 2014 ($17.90 for 337 cases). This dry rosé is intense in aroma and presents in the glass with a vivid colour. The flavours include cherry, blackberry and raspberry with a hint of pepper on the finish. The wine is 55% Merlot, 20% Cabernet Franc, 12% Syrah, 11% Cabernet Sauvignon and 2% Malbec. The 13.4% alcohol peaks through the intensity. 88. C.C. Jentsch Cellars The Chase 2013 ($20 for 7,488 cases). This Bordeaux blend is the winery’s signature red blend. The winemaker calls it a “hidden gem” because of the value/quality relationship. This is a blend of 32.5% Cabernet Sauvignon, 32.5% Cabernet Franc, 30% Merlot, 3% Petit Verdot and 2% Malbec. The wine has a generous texture with soft, ripe tannins. There are aromas and flavours of black currants, red fruit, chocolate and vanilla. 90. C.C. Jentsch Cellars Cabernet Merlot 2013 ($16 for 1,062 cases). This is 43% Cabernet Franc, 37% Merlot and 20% Cabernet Sauvignon. The little brother to The Chase, it is designed for current drinking. It has a juicy texture, with aromas and flavours of raspberry, cherry, blueberry and strawberry. 89. C.C. Jentsch Cellars Syrah 2013 ($29.90). This wine, dark in the glass, begins with smoky aromas of leather, deli spices and pepper. On the palate this is a bold, meaty wine with flavours of black cherry and black olives. There are appealing earthy and peppery notes. This wine is already piling awards at competition. 91.